Marcus Fernstrom created and developed AmiNote for Aros and uploaded his work to the archives for us. AmiNote is a simple but brand new utility for keeping notes. It creates a save file with the note in the same directory as the binary. 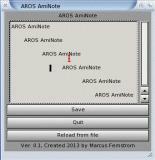 This utility is completely developed by Marcus and is his first software release for Aros.